Multi-factor authentication can prevent accounts from being accessed if passwords are stolen or obtained using brute force tactics; however, Proofpoint has discovered that multi-factor authentication is being bypassed on Office 365 and G Suite accounts using the legacy IMAP protocol. Proofpoint reached the conclusion that threat actors managed to reach a surprising 44% success rate when it came to breaching accounts at targeted organizations. “As organizations continue to move their mission-critical business functions to the cloud, cybercriminals are taking advantage of legacy protocols that leave individuals vulnerable when using cloud applications,” said Ryan Kalember, executive VP of Cybersecurity Strategy for Proofpoint. Following successful breaches, most attackers logged on Nigerian IP addresses with around 40% of all successful malicious efforts originating from Nigeria, while Chinese actors were behind roughly 26% of successful breaches. While the bad actors behind these attack series against cloud accounts managed to bypass MFA protections by abusing the unprotected IMAP protocol, the brute forcing attacks they used to crack their way inside the accounts employed tried-and-tested techniques such as large-scale phishing campaigns, as well as credentials obtained following data breaches and data leaks. 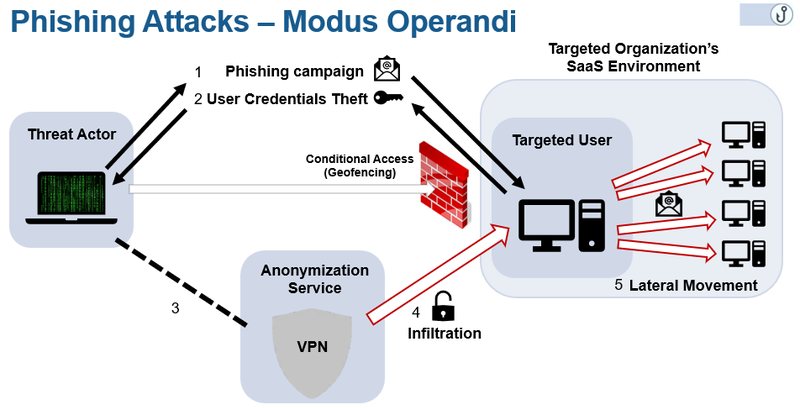 The attackers would use the breached cloud accounts to disseminate malware throughout the targeted organizations, gain access to confidential information that can either be sold or used as part of future attacks, as well as fraudulently reroute fund transfers to accounts they control by hijacking employee payroll systems and company banking accounts. The huge 60% spike in breached accounts noticed by Proofpoint during December stands witness of the impact leaked collections of credentials can have, considering that during that period of time the 87 GB Collection #1 containing 773 million unique emails and associated passwords was spotted being promoted on an online hacking forum. However, as discovered later, Collection #1 was just a small part of a much larger 993 GB credential database, made available for sale for only $45 and comprised of credentials in the email:pass, user:pass, or number:pass formats. What’s certain is that, for the time being, there is definitely no shortage of readily available huge collections of credentials given that even more recently, during February, a batch of 127 million records stolen from eight different companies was put up for sale on the Dream Market marketplace for $14,500 in Bitcoin. And, to make things even worse, the same group listed another batch of 620 million accounts earlier during the same week, stolen from 16 other companies and coming with a price tag of $20,000. 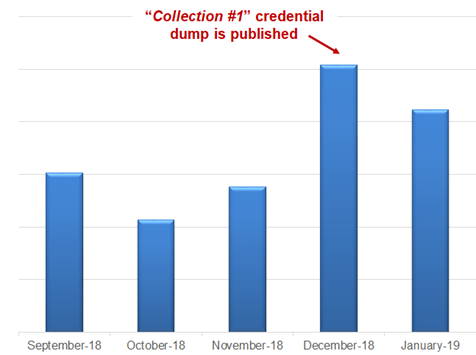 Huge credential leak events lead to large increases in the number of credential stuffing attacks as shown by Akamai in their 2019 State of the Internet report which revealed that 28 billion credential stuffing attempts were detected during the second half of 2018, between May and December 2018, with retail websites being the main target of credential abuse with 10 billion attempts. “These attacks are laser-focused on specific individuals, rather than infrastructure, and continue to grow in sophistication and scope. As a best practice, we recommend that organizations establish a cloud-first approach to security that prioritizes protecting employees and educates users to identify and report these advanced techniques and methods,” also stated Kalember. Previous: Are You Still Manually Provisioning New Users in Hybrid Active Directory/Office 365?